I first visited Lone Pine, Calif., in 1982, but I’ve known it by heart since the early ’50s. 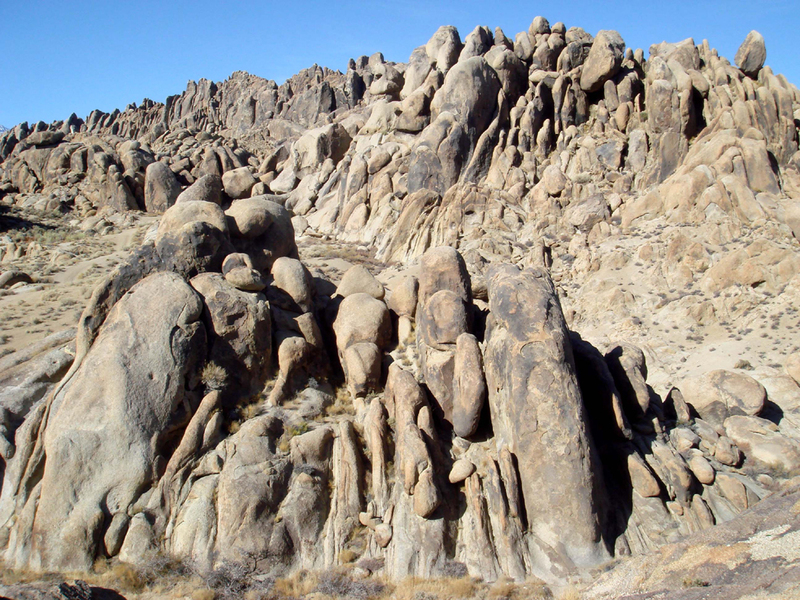 I didn’t know where it was, but I saw the boulder piles of its Alabama Hills in every B-Western I watched on TV. For a small boy growing up in New Jersey, the Alabama Hills was the West. The tiny, dusty town lies directly under Mt. Whitney, the tallest mountain in the Sierra Nevadas, and the the highest in the lower 48. 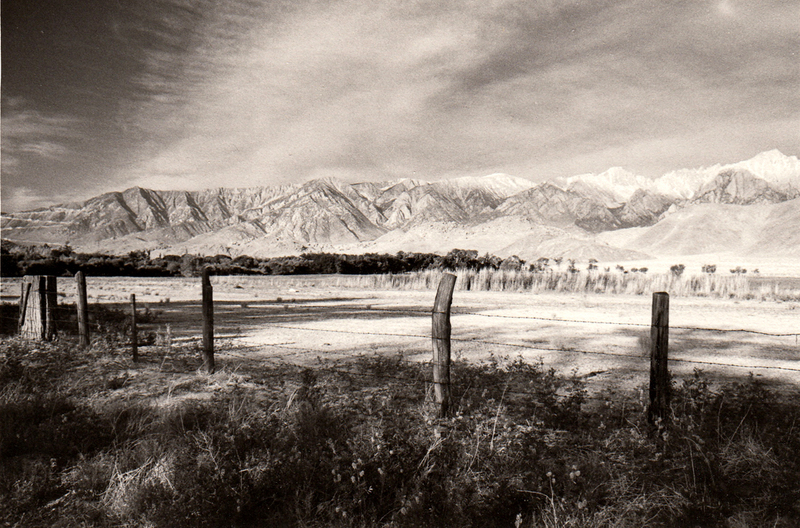 The snow streaked arete forms an impenetrable wall to the west of Owen’s Valley, which Lone Pine sits in the center of. To the east, the impressive Inyo Mountains look soft and velvety in contrast to the hard, stony face of the Sierras. It wasn’t just Westerns that were made in Lone Pine, though. The valley and hills stood in for India in The Lives of the Bengal Lancers, Kim, King of the Khyber Rifles and Gunga Din. For the last, a great “Temple of Kali” was built up in the hills. It was also the location for Humphrey Bogart’s “Mad Dog” Earle in High Sierra. Later, the terrain was the backdrop for The Lone Ranger, Wild Bill Hickock, Gunsmoke, Rawhide, Bonanza and Have Gun, Will Travel. 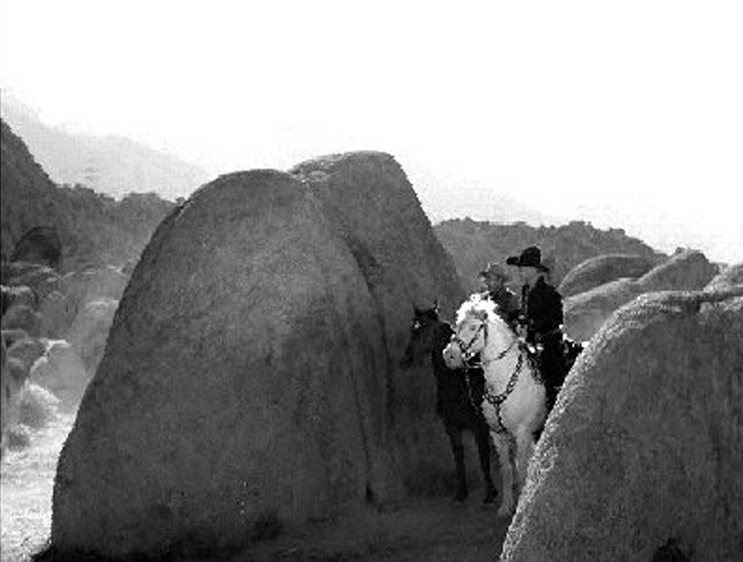 You can hardly watch a Western without seeing those great rubble-heaps of boulders catching the afternoon sun. But for me, it is the silvery grays of the landscape, shot in orthochromatic film in the ’30s, that define what the West looks like. It is the scenery in every Hoot Gibson, Ken Maynard, Buck Jones and Gene Autry film. You can drive down Movie Road, up the west slopes of the Alabama Hills, and see where the Lone Ranger was ambushed in the very first episode, see where John Wayne and his Singing Riders captured Black Bart’s gang in Westward Ho, and see where Gene Autry jumped from his horse, Champion, to a speeding convertible in Trail to San Antone. 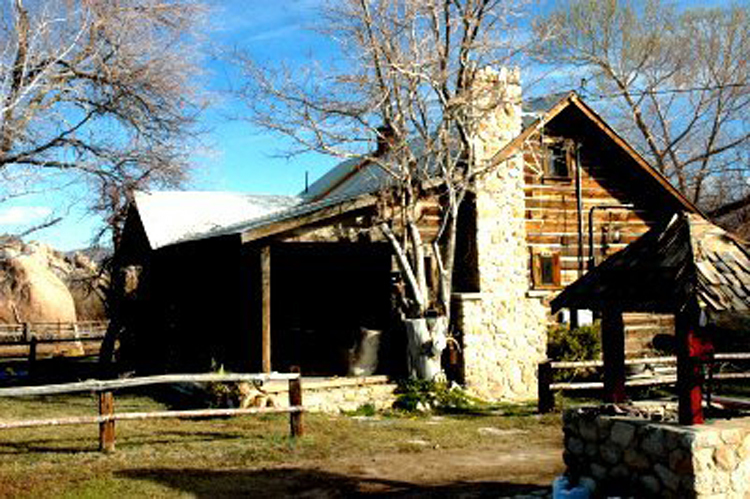 There are more sites up Tuttle Creek Road, including the “Hoppy Cabin,” where William Boyd lived during the shooting of the Hopalong Cassidy films. The cabin is still there. You will recognize it from other films it’s been in. Over the years, many sets have been built in the hills, but except for the Hoppy Cabin, they are all gone. 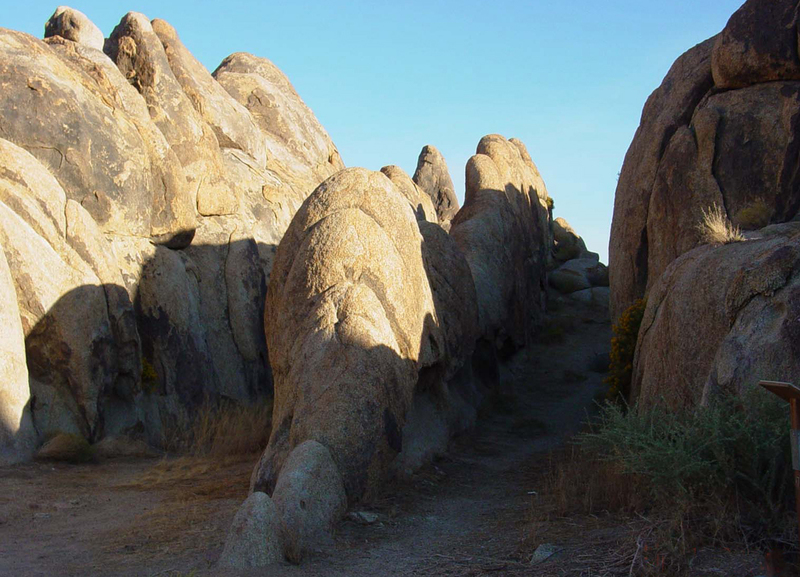 The Bureau of Land Management, which administers the area, has dedicated nearly 30,000 acres as the Alabama Hills Recreation Area and plans to preserve the Hills in as close to a natural state as possible. The hills, by the way, were named at the time of the Civil War by a group of Southern-sympathizer miners, who were looking for gold among the rocks. When the Confederate cruiser, C.S.S. Alabama, wreaked havoc on Union shipping, they named their claimsite after the ship. In retaliation, 15 miles to the north, Union-sympathizing miners named their claim “Kearsarge,” after the Yankee ship that sank the Alabama. That name remains on a mountain peak, a pass and a town east of Independence in the Inyos. I LOVE this blog post! Thanks for highlighting one of my favorite places on Earth. I just wrote about the upcoming Lone Pine Film Festival at http://www.owensrivergirl.com. Maybe we’ll see you there?